The Government of Canada held a recent Express Entry draw on Wednesday, March 6, inviting 3,350 Express Entry candidates to apply for Canadian permanent residence. The Comprehensive Ranking System scores this time dropped to 454, a decrease of three points over the minimum score of 457 in the previous invitation round held on February 20. After this draw, a total of 17,850 Invitations to Apply (ITAs) have been issued this year through the Express Entry system — an increase of 6,350 over the 11,500 ITAs that had been issued by this same time in 2018. Similar to the previous draws, a tie-break rule was applied in the March 6 draw. The time stamp used was February 11, 2019, at 17:21:27 UTC, i.e. 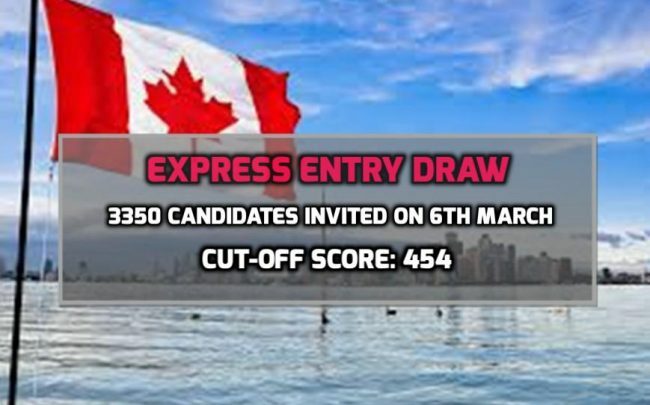 all candidates with a CRS score of 454 or above, who entered their profile in the Express Entry pool before the mentioned date and time, received an ITA in this invitation round. Candidates who meet the eligibility requirements for these categories are entered into the Express Entry pool where they issued a Comprehensive Ranking System (CRS) score awarded for factors such as their age, education, work experience and proficiency in English or French. A set number of the highest-scoring candidates are selected regularly from the pool by the Immigration, Refugees and Citizenship Canada to apply for Canadian permanent residence. How can you increase your Express Entry profile ranking? There are a number of ways which can improve a person’s ranking in the Express Entry pool, among them provincial nomination has the greatest impact. One can gain an additional 600 points toward their ranking score, if nominated by a province, effectively assuring an ITA in a subsequent Express Entry draw.